Ultimate camp gives you the best of both worlds. Spend Monday & Tuesday as a day camp youth and then, beginning on Wednesday, join the Resident program. You will receive both camp t-shirts and patches. Resident camp is a 3 day / 2 night camping experience for Wolf, Bear, Webelos & AOL Scouts; providing a fun-filled environment within Camp Lakota. The Boy Scout summer camp staff will be working with you to help grow your outdoor skills and learn new ones as we explore scouting. Scouts will have the opportunity to explore camp and use different program areas not available during Day Camp. All meals (3 lunches, 2 suppers & 2 breakfasts) are provided in the dining hall and scouts will have the opportunity to cook their own meal too. Adults – Enjoy the fun with your child or your den and receive the same meals, shirts & patches. 2 adults are required for every 8 youth with an additional 1 adult for every 1 to 4 youth. Example: 6 youth – 2 adults, 9 youth – 3 adults. As an incentive: Receive 1 free adults for every 5 youth in attendance. Day Camp is a great summer activity for all youth entering the 1st through 5th grade in the fall and it has no overnight camping. 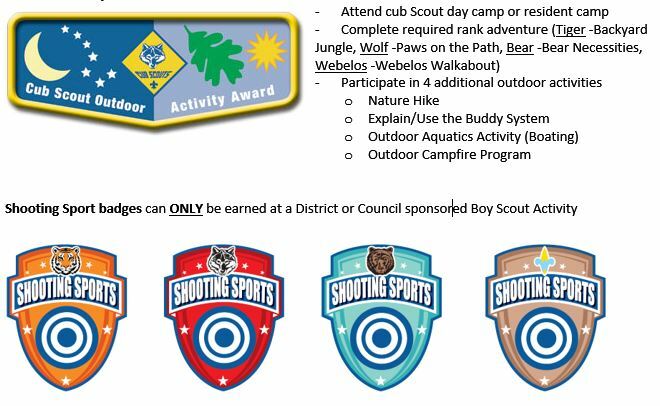 With our theme, Cub Scouts and Community Youth can shoot BB guns, bows & arrows, learn about nature, do crafts and woodworking, play games, sing songs, and do many more activities! Adults can be a part of camp too by volunteering to be a day leader and join your child in the camping experience. After 6/17/2019 a fee of $10.00 will apply to all 1st Grade Youth - Tiger Registrants. After 6/17/2019 a fee of $20.00 will apply to all 2nd Grade Youth - Wolf Registrants. After 6/17/2019 a fee of $20.00 will apply to all 3rd Grade Youth - Bear Registrants. After 6/17/2019 a fee of $20.00 will apply to all 4th Grade Youth - Webelos Registrants. After 6/17/2019 a fee of $20.00 will apply to all 5th Grade Youth - AOL Registrants. Council Refund Policy as of March 2013 GENERAL INFORMATION PERTAINING TO ALL REFUNDS No refunds will be issued for activities where promotion literature states "No refunds". Deposits are non-refundable. All monies are refundable if the council or district cancels an event. Refund requests for rescheduled events due to weather conditions will be dealt with on an individual basis, partial refunds can be granted after incurred expenses for the event have been taken into consideration. Transferring fees from one person to another within the same unit for the same program is permissible. Fees are not transferable from one event to another. No refund request for any event or facility will be accepted more than 14 days after the conclusion of the event. For resident camps, each session or week is considered a separate event. Any refund granted will be credited back to the source of the original payment. i.e., Credit card back to credit card, check back to checking account, etc. Valid reasons for requesting a refund include: Illness Death in family, or Change in business plans. In no event shall any refund be made for any reason if the cost of the event has not been completely met. If substitution for participation in the event has been secured, then full refund may be made to the individual originally registered. Any refunds granted will be reduced by the cost of any deposit plus the cost of any materials already procured. Refunds will not be made for late arrivals or early departures. All requests for refunds of money must be made in writing to the Black Swamp Area Council, Boy Scouts of America. Supporting receipts must accompany the request.